Dill plant is also known as an extraordinary condiment that enhances the taste of food, but is also very effective as a cure. Dill tea facilitates digestion, disinfects the oral cavity, and eliminates stress and insomnia. Since ancient times it is known that this plant helps with sleeping. Fennel or dill is most commonly used as a popular spice in cuisines all over the world, because of its aroma it enriches many international dishes. It comes from eastern coast of the Mediterranean Sea, where it is used as a remedy for many ailments. Thanks to the intense flavor and low price, dill herb has been domesticated and used in our kitchen. It is added to many salads, soups, meat dishes, fish, mushrooms, vegetables, along with the eggs. Particularly popular is dill sauce. Recently used are various butters of spices, and alcohol solution of these plants which are highly concentrated and should be used in very small doses (in the form of drops, one or two per liter of fluid). Its herbaceous stem and fresh young leaves are mostly used to prepare, delicious dishes. Mature fruit contains important essential oils that consist of limen, carvone - even up to 50 percent of feldandren and many other substances. For treatment herbalists recommend ​​dill tea, which proved to be excellent remedy for many health problems. Dill Latin name - Anethum graveolens. Dill plant prevents cramps in the stomach. Namely this cheap and quality spice still has a lot of healing properties. Dill is rich in vitamins A, C, beta-carotene, folic acid, riboflavines, niacin. Vitamin A is important for healthy skin and mucous membranes, and acts preventively in the case of lung and oral cavity cancer. The plant dill when fresh is rich in vitamin C, which plays an important role in fighting infections. Spice is a natural source of minerals such as calcium, copper, manganese, calcium, iron, magnesium. Copper plays an important role in the production of certain enzymes, while potassium affects the blood and body fluids pressure. This herb is rich with antioxidants and contains dietary fiber, which control the level of cholesterol, preventing the formation of gas, bloating and indigestion. Dill tea accelerates peristalsis and is an important ingredient of the tea mixture against constipation and for the treatment of hemorrhoids. The essential oil of dill is excellent in neutralizing bad breath, soothes tension, relaxes the nerves, prevents insomnia and encourages better secretion of breast milk. Use 20 grams of dill, anise, fennel, angelica and cumin and mix well, and pour a tablespoon of tea with half a pint of boiling water only. Cover, and let it sit for at least half an hour, after which you need to strain and drink after meal. Dill plant will certainly speed up metabolism and improve digestion. 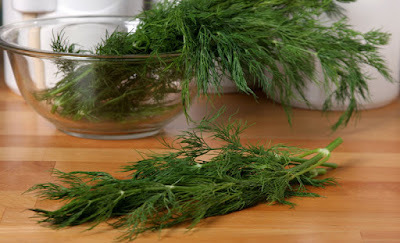 With 2.5 dl boiling water pour four small teaspoons of dill seed or 2 teaspoons of chopped plant (fresh or dried) and leave covered for 3 to 4 minutes. Strain and drink the tea without adding sugar. More recipes for the treatment of hiccups, read the text how to stop hiccups. Ten drops of essential oil put on a sugar cube, eat and then drink a glass of water. In case of bad breath recommended is to chew fresh dill. We recommend the article; how to eliminate bad breath. Mix 25 grams of spices, lemon balm, hops and valerian. Spoon of mixture pour with 2.5 dl of boiling water, then cover and leave to stand for at least half an hour. Strain and drink sweetened with honey, an hour before sleeping. Dill plant will soothe and provide good sleep. Read more in article on how to treat insomnia. Teaspoon of ground dill pour with 2.5 dl of boiling water, cover well, let it sit for half an hour and strain. Drink tea in sips 3 times a day after meals, unsweetened in case of gastric problems and sweetened if you have some disease of the lungs. Three branches of dill pour with 1 dl of white wine, close the jar and let it sit for five days in a dark place. Strain and drink one glass after a meal in the case of problems with digestion. As you can see dill plant is highly beneficial for our bodies, and certainly should be included in the diet.